TechCrunch reports the Pakistan government is blocking WordPress sites. According to multiple local outlets, WordPress blogs are currently not accessible in Pakistan and pointing the blockage at the Pakistan Telecommunication Authority (PTA). TechCrunch has not been able to confirm that yet. As it stands right now, WordPress.com and blogs hosted by WordPress cannot be reached. Self-hosted WordPress blogs still work. it is not surprising that Pakistan would block these sites. The government has a track record of blocking Twitter, Facebook and other Internest social sites. [T]he owners of Pakistani media powerhouses — namely ARY News, the Express Media Group, and Dunya News — received instructions from the military establishment to support the “dissenting” leaders and their sit-ins. The military was using the media to add muscle and might to the anti-government movement in an attempt to cut Prime Minister Nawaz Sharif down to size. A militant religious group in Pakistan are threatening two journalists for uncovering a private detention center run by a the group. The families of the journalists have also received death threats. Mr. Ghulamuddin, senior producer and Mohammad Aatif Khan, associate producer/news, Samaa TV aired an exclusive report on December 13, 2011 on the captivity of innocent students in chains at a seminary which jolted the media and concerned authorities. The subsequent crackdown by police led to the rescue of over fifty persons who were shackled in a basement. Dozens of children were recovered from a separate room. The illegal and private detention center and torture cell was operated under the name of ”Rehabilitation Center for Heroin addicts” where the people from 4 to 50 years of age were detained and punished for not following the orders of the detention center staff. The guards of the detention center claimed that they were running an Islamic seminary (Madressa). Since the airing of the video, the two journalists and their families have received death threats. The latest development in the case is that Mr.Gulamuddin, who is hiding with his wife Tasleem Bano and Hayyan Shah Alisher (six month old infant) and Mohammad Aatif khan with his wife Sajjal Atif Khan have both left their homes as the militants attacked their houses and threatened their parents, siblings and neighbours at gunpoint to disclose their whereabouts or else face the same fate planned for the producers. They are also receiving death threats through SMS and phone calls due to which they have stopped using them. They are not even allowed to go to the police station and file a report against the culprits. Their movements are being monitored all the times. Pakistan remains the most dangerous place for journalists. According to the Committee to Protect Journalists, seven journalists were killed specifically because of their work. Another 42 journalists were killed but the CPJ could not determine the reasons for the murders. The AHRC notes that journalists can expect little help from the authorities. Broadcast reporter Mukarram Khan Aatif was killed in his mosque near Peshawar yesterday. The Pakistan Taliban took credit for the assignation after threatening him and his family for his work. The killing shows the continued threat journalists face in Pakistan. According to the Committee to Protect Journalists, Pakistan is the most deadly place for journalists. Since 1992 CPJ has been able to confirm that 41 journalists were killed in Pakistan because of their work. An additional 14 were killed but the motives for the killings could not be confirmed. The killing of Aatif was clearly because of his work. There is a need to differentiate between journalists killed because of their work and journalists killed. To hear some organizations tell the story, Honduras is one of the most dangerous places in the world for journalists. Yes, since 1992, eighteen journalists have been killed, but only five of those killings can be directly attributed to the journalists’ work. That leave 15 murders with unknown motives. Could those 15 other killings have been because of a person’s job? Possible. But we will never know because Honduras has such a weak legal and political system. And the police force has no real ability to seriously investigate the crimes. There are too many cases of journalists being killed in Honduras that can be seen as “wrong place, wrong time” killings. And in other cases the killings may have nothing to do with the person’s job. Case in point could be Luz Marina Paz. Paz, a broadcast journalist, did not receive any threats because of her reporting, yet she was gunned down December 6, 2011 while test-driving a vehicle she was considering buying. The vehicle was owned by an army colonel. Was he the actual target? Paz operated a small stall at a weekend market. She refused to pay the “war tax” imposed by gangs and narco traffickers. (In the US we would call it a “protection racket.”) Was she a target because of this? Or was the target the mechanic with her in the car? Bottom line is that it does no one any good to claim all the killings of journalists in Honduras — or in any other country — are because the journalists are being targeted. It is poor reporting because it is not factual. The unfortunate part about the facts is that they require time to explain. In an era of soundbites and 140 character limitations, fully explaining something is becoming more difficult. It is fine to use journalists, students, lawyers, opposition politicians, etc as examples of important people killed to highlight the violence of some countries. But the killings have to be placed in context. Was the opposition party leader killed because he opposed the government? Or did he piss off a gangster, a narco or even an ex-wife? We know that Aatif was killed because the Taliban did not like his work. He was a clear victim of the Taliban. We also know that other journalists in Pakistan were killed because they reported on things powerful interests in the country did not want revealed. We do not know why Paz was killed. Nor do we know why a total of 35 journalists were killed last year. We do know that 46 were killed because of their work. Instead of reporting just that X number of journalists/students/lawyers were killed in Country Y, it would be nice if the international media would look into why those individuals were killed and what is being done to bring the killers to justice. I would be willing to bet — maybe not $10,000 — that the real reason is not known because of weak or corrupt political and legal systems. And, to me, THAT is the story. The Committee to Protect Journalists issued its list of journalists killed in 2011. And what is important about this list is that CPJ divides the list between those journalists killed because of their work and those killed for undetermined reasons. According to CPJ 43 journalists were killed this year because of their work. The most deadly place for journalists was Pakistan with seven journalists killed directly related to their jobs. Remember, these are killings directly attributable to the job of journalism. The CPJ seems to be the only group working to investigate why some journalists are killed around the world. According to the CPJ, an additional 35 journalists were killed but the reasons for those killings cannot — or have not yet been — tied to the journalist’s work. And it is this category that all of the Honduran killings fall. Adding in this list, Pakistan becomes worse with an additional five killings this year. Mexico would add another four, etc. One of the important thing about good journalism is its commitment to getting the story right. It does little good to hype all killings of journalists as attacks on the media. 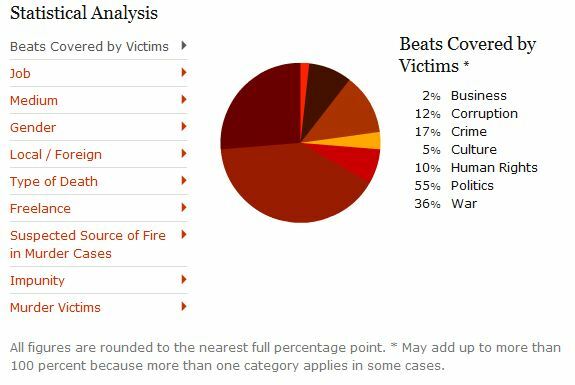 And yet over and over journalism organizations look at the total number of journalists killed — with the exception of CPJ — as evidence of attacks on the media. Could some of the unconfirmed attacks be related to the journalists’ job? Sure. But without facts to back up the accusations, the distinction is important to make. Those of us who follow global journalism issues and problems are not surprised but it is always nice to hear someone outside the profession state that being a journalist is a dangerous profession. Thanks to Roy Greenslade at the Guardian we get to see a story about this situation. Journalism is now regarded as one of the world’s most dangerous professions. According to the United Nations high commissioner for human rights, Navi Pillay, the situation has become so bad that a strategy is required to protect journalists. To be sure, even the number of journalists killed is in dispute. So far this year, according to the Committee to Protect Journalists, 35 journalists have been killed around the world. The deadliest country so far this year is Pakistan, with six murders. Reporters Without Borders (RSF) claim 52 journalists have been killed this year. The differences between the counts is often because of the way the murders are counted and confirmed. RSF: “Journalists killed” in the table includes only cases in which Reporters Without Borders has clearly established that the victim was killed because of his/her activities as a journalist. It does not include cases in which the motives were not related to the victim’s work or in which a link has not yet been confirmed. CPJ: We consider a case “confirmed” only if we are reasonably certain that a journalist was murdered in direct reprisal for his or her work; was killed in crossfire during combat situations; or was killed while carrying out a dangerous assignment such as coverage of a street protest. We do not include journalists who are killed in accidents such as car or plane crashes. We include only confirmed cases in the statistical analyses in this database. Asian Human Rights Commission reproduced a statement from Hameed Haroon, the president of the All Pakistan Newspaper Society, that slain journalism Saleem Shahzad had received threatening messages from the ISI, Pakistan’s intelligence agency, on at least three occasions. This information contradicts the weak claims by ISI that they did not contact the journalist. Shahzad’s mutilated body was found last week, two days after his adduction. The body bore marks of severe torture. Suspicion immediately fell on the ISI shortly after Shahzad published an article linking the Pakistan Navy with al-Qaeda. Just before his kidnapping, Shahzad told friends he received threatening calls from intelligence officers. Shahzad is the 70th journalist in Pakistan since 2000 to be killed because of his profession. A leading newspaper publisher in Pakistan and the president of the nationwide newspapers body has reacted sharply to charges by the Inter Services ‘Intelligence Agency (ISI) that allegations by Human Rights Watch of the intelligence agency’s involvement in the murder of Pakistani journalist Salim Shahzad were “baseless” . It has come to my notice that a spokesman of Inter Services Intelligence (ISI) while speaking to the official national news agency in Islamabad yesterday has questioned the “baseless allegations” leveled by Human Rights Watch on the basis of an E mail from Salim Shahzad, the Bureau Chief of the Hong Kong based Asia Times Online, in their possession . Mr Shahzad was murdered three days ago near Islamabad after being abducted by unknown persons. As President of the All Pakistan Newspapers Society (APNS) and as head of Pakistan’s leading media group I consider the the security of journalists to be of paramount importance. At present the APNS has officially committed itself to the creation of a national body for the investigations of serious threats to the lives of journalists, a body which the Committee to Protect the Journalists in New York, and other leading organizations in the Pakistani press and human rights bodies have promised to lend vigorous support to. Pakistan has one of the high rates in the world for journalists killings and such an environment is inimical to the functioning of democracy. The government and the intelligence agencies should take the investigation into Mr Shahzad’s murder seriously and examine his last testimony closely. Whether the Oct 18th incident itself or his last article in the Asia Times Online, that alleged Al-Qaeda penetration of the security curtain for Pakistani Naval establishment in Karachi hastened his murder is for the official investigation to uncover. And nobody not even the ISI should be above the law”.